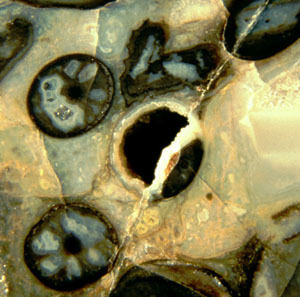 Large voids occasionally seen in the tissue of several plant species in the Rhynie chert (Lower Devonian), appearing as conspicuous patterns on cross-sections, have been arguably explained as a result of drying or decay of the dead plant . Contrary evidence comes from the rare phenomenon of pairs of patterned sections with similar aspect (Figs.1,2). Incidental formation of such pairs would be quite improbable. Drying or decay would not produce strikingly similar patterns. one large void and four smaller ones. The similarity rules out incidental void formation by decay and shrinkage. 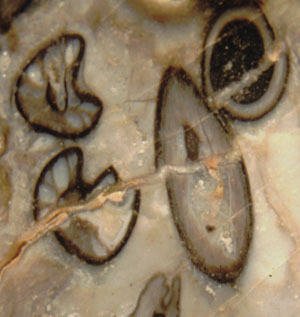 Fig.2 (right): Aglaophyton sections, two of them with similar voids and with odd shape, suggesting their relation as prongs of a forked shoot. The similarity of aspect hints at abnormal growth as a cause of void formation in Rhynie chert plants. The similar aspect of two neighbouring sections strongly suggests that they represent the prongs of a forked shoot, with each prong having inherited the cause of void formation from their common base. Thus the phenomenon of twin patterns leads to the conclusion that the voids were formed in the living plant, very probably by abnormal growth due to fungus infection. This is supported by the observation that well preserved samples show intact tissue around the voids.